A pair of petrol stations immediately north of Longbridge Island. The former northbound Little Chef before it was demolished. The site was built in the 1980s. It was considered as an alternative to building Warwick services on the M40 and the other options that were considered. It was even suggested that a bridge over the A46 could be built so that M40 traffic doesn't need to make too long a detour. It was built as a pair of Little Chefs, which gained Burger Kings. The northbound Little Chef closed in 2007 only to re-open in 2009 and then close again in 2012. 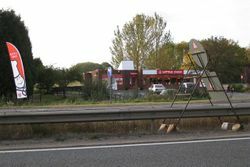 The southbound one served as the Autogrill Cafe for a few years before becoming The Breakfast Junction which closed in 2018. The filling stations were originally branded Mobil. 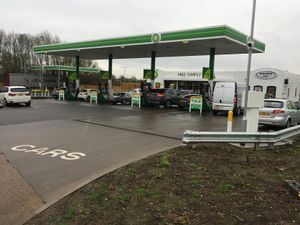 They were refurbished between 2008 and 2009, and the southbound filling station was further refurbished in 2017 gaining an M&S Simply Food store in the process. A Euro Garages-operated Starbucks drive thru opened on the southbound side in August 2015. During late 2018, the former northbound Little Chef building was demolished to make way for another Euro Garages-operated Starbucks Drive Thru which opened in February 2019.